Owning a swimming pool, you know how important it is to keep it in good condition all the time. An amazing pool area provides enjoyment, relaxation, and great entertainment. With that comes the responsibility of proper maintenance. Fortunately, there are ways you can do so without breaking the bank. Now, you can keep the concrete pool deck aesthetics and safety in check affordably. Pressure washing concrete pool deck is one highly recommended way of getting stubborn dirt and debris off of a deck. However, not everyone has a pressure washer or could afford to buy one. There is a workaround for this. 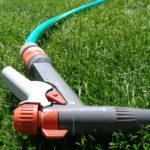 By simply attaching a fireman type nozzle with a 250 psi rating, you can use your garden hose to pressure wash the deck. Although there are high-pressure nozzles out there claiming to create the same pressure, a fireman nozzle is more effective. If you find some damaged areas on your pool deck, worry not. 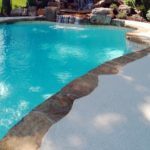 Most cracks and surface damage can be resolved with a pool deck repair. One such method is pool deck resurfacing. This involves the addition of a thin layer of overlay or coating on the deck, covering any unwanted blemish while giving the deck a whole new look. A stamped overlay and a spray texture coating are both highly recommended resurfacing materials that are durable, cool to the touch, and slip-resistant. Pool deck refinishing is also another repair option but this is mostly for covering stubborn stains and discolored concrete. Concrete is a very porous material. If you want to optimize maintenance, the surface must be resistant to damage. It needs something that could minimize or slow down, if not totally eliminate, the harmful effects of water, sun, and other outdoor elements. A pool deck sealer is highly recommended by concrete contractors because of its protective properties. It seals off the pores, keeping dirt and moisture from penetrating past the surface. 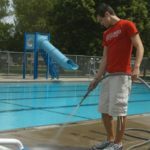 Aside from its protective benefits, sealers also enhance color and add a bit of shine to an otherwise dull pool deck. There are times when leaves would fall on the deck and it would not bother you at all. However, harmless as it may seem, leaving organic material to rot on a concrete pool deck could be detrimental. The juices produced during the rotting stage could seep into the deck and weaken the spot it occupies. Also, it could leave ugly, hard-to-remove stains.